Product prices and availability are accurate as of 2019-04-19 00:25:06 UTC and are subject to change. Any price and availability information displayed on http://www.amazon.com/ at the time of purchase will apply to the purchase of this product. Wissotzsky Blood Orange & Mandarine Tea - A citrus orchard teaming with vitamin C. An exhilarating of tart Blood oranges and sweet Mandarines gives this infusion its unique flavor. Wissotzsky English Breakfast Tea - English Breakfast is a blend of the finest tea leaves growing in the hilly areas of Ceylon, India and Kenya. A classic blend based on the famous English tradition which makes a refreshing stimulating beverage. 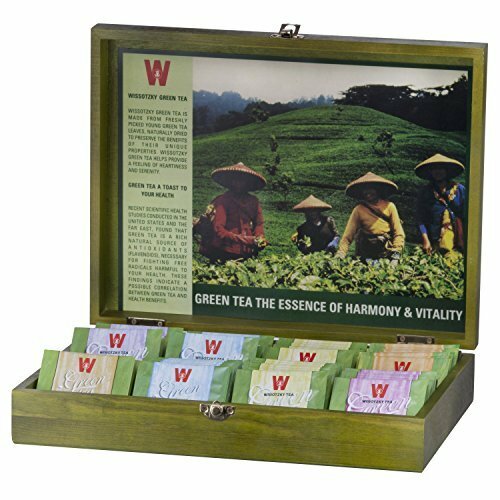 Wissotzsky Classic Tea This special home blend of superior quality black teas from India, Africa and Ceylon has been produced for nearly 160 years. A strong, full bodied tea blend with a rich flavor and aroma. Wissotzsky Mediterranean Spearmint NANA Tea - A celebrated Mediterranean tradition with a cool refreshing breeze. The finest blend of selected tea leaves and fresh spearmint gives this aromatic infusion its unique scintillating flavor. Wissotzsky Chamomile Tea - Using fresh, dry, fragrant evergreen chamomile flowers, this aromatic herbal tea is famous, for its calming effects. It soothes and relaxes with each sip providing a totally tranquil feeling. Caffeine Free. Wissotzsky Wildberry Nectar Tea - An exquisite blend of wild forest berries, blackberries, blackcurrant and raspberries creates an infusion with a rich flavor and fragrant aroma. Caffeine Free.